Have you ever eaten Little Debbie's Pumpkin Delights? My friend Erin introduced me to this seasonal cake-like cookie a long time ago, back when I lived in Florida. She would wait for October to arrive every year so that they would be available in stores, and she would always share them with me. 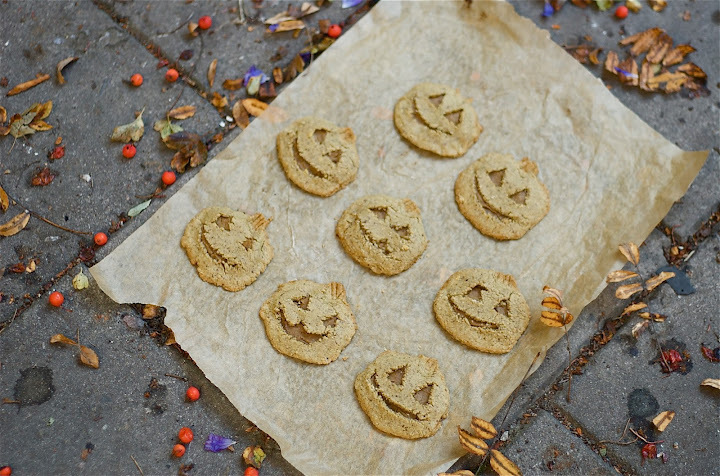 Pumpkin Delights are a soft cookie with a gooey filling in between. Whenever October comes around, Erin and I are talking about Halloween costumes and this cookie and I've been pondering on how to recreate it. Today I sort of had a light bulb moment that I wanted to make these treats healthy and actually started experimenting right away. The amazing cholesterol-lowering oats have the potential to create a soft and tender cookie. And the filling should just be pumpkin, right? Well I had roasted butternut squash lying around so I used it but roasted pumpkin purée works perfectly too. The combination was so delicious, appropriately seasonal, gluten-free, and healthy without refined flour or sugar, so I am a happy camper. I hope Erin that you will try this recipe as it's pretty close to what I remember as the real thing. And Happy Halloween! 1. Make the dough: Mix the ground flax with the 2 tablespoons water in a separate bowl. Melt the coconut oil, then mix with the purée, oat flour, baking soda, salt and cinnamon. Then add the flax mixture and bring into a dough. You may need an extra tablespoon of water if the dough does not come together. Chill in the fridge while making the filling. 2. Make the filling: Grind until smooth the pumpkin or butternut squash purée in a food processor with dates or raisins, cinnamon, ginger, cloves, salt and water. 3. Preheat oven to 180C or 350F. Divide the dough into half. Roll to 1/8 inch thick and cut out pumpkin shapes with either a cookie-cutter or with an instant coffee lid and a knife. Arrange on a parchment paper-lined baking sheet, leaving at least an inch space between each cookie. Spread about a tablespoon of filling onto each cookie, leaving 1/4 inch edge around. Roll the other half of dough to 1/8 inch thick. Cut out pumpkin shapes and then cut out two triangle eyes and a mouth on each. Place over each cookie on top of the filling, pressing the sides so that it's sealed. Apply pressure on top of the pumpkin and press forward to create a stem. 4. Bake for 10-15 minutes until golden around the edges. Cool and enjoy! Store the rest in an air-tight container for a day out or in the fridge for a week. These are adorable and bring up such good memories of childhood and eating those Little Debbie cakes . I can't wait to make these . I think they are perfect for the season !